Amid its ongoing $500 million construction and campus renovation campaign, Liberty University will build a 78,000-square-foot home for its School of Business, to open by fall 2018. The building will stand where Religion Hall now is located on Liberty’s Lynchburg campus. Its cost has not been finalized. Liberty’s business school isn’t alone in making ambitious plans. The business of teaching business is booming these days at Virginia’s major universities, which are erecting buildings, starting new endeavors to encourage entrepreneurship and expanding degree programs. For example, Virginia Tech’s Pamplin College of Business is building a new $225 million campus, to be called the Global Business and Analytics Complex. 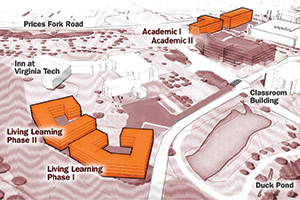 It will include two 100,000-square-foot academic buildings and two residence halls. Construction will begin in 2020 (on a site now occupied by parking lots) and is expected to be complete by 2023. James Madison University’s College of Business also is expanding to meet the demands of growing enrollment. It is building a College of Business Learning Complex, a $15 million, 166,000-square-foot expansion and renovation project. The school’s current home, JMU’s Showker Hall, was built in 1991 for 2,400 students. It now is packed with more than 5,000. The Business Learning Complex is designed by New York-based Robert A.M. Stern Architects (RAMSA) and Richmond-based Moseley Architects. So far the university has raised $7 million toward the project, which will break ground in late 2018 and should be completed by fall 2020. Aside from creating some much-needed elbow room, though, the new complex also will better reflect changing business school philosophy. Collaboration and innovation “will be at the heart and soul of the design,” she says. Entrepreneurship and creativity are hot topics at many universities. Take Virginia Commonwealth University’s School of Business, which this year launched a strategic plan aimed at promoting creative thinking among business students. Called EPIC (Experiential learning, Problem-solving curricula, Impactful research and Creative culture), the initiative capitalizes on VCU’s reputation as the No. 1 public arts and design school in the nation. The initiative has included the ongoing “Shark Tank”-like EPIC Challenge, a competition to pitch ideas to support the EPIC ethos. Open to teams comprised of faculty, students, staff and/or alumni, a handful of teams have so far received $30,000 to $70,000 to develop their ideas. Winning concepts include a new education model that would have students accessing some lecture content online and devoting more class time to team activities and homework. Also cultivating creativity and entrepreneurship is the University of Richmond’s Robins School of Business, which converted one of its classrooms into an innovation lab featuring open space and several writable surfaces to encourage student startup businesses, collaborations and entrepreneurship studies. Students participating in the university’s summer Richmond Guarantee program, which provides $4,000 to students for fellowships or faculty-sponsored research projects, will be able to apply that funding toward startups that they work on in the lab, says Dean Nancy Bagranoff. Business schools also are expanding degree programs. The University of Virginia’s Darden School of Business has added a Washington, D.C.-area location for its Executive MBA and Global Executive MBA programs. Its home is on the 25th floor of the Waterview Tower in Rosslyn, overlooking the Potomac River and the Jefferson and Lincoln memorials. Meanwhile George Mason University’s School of Business is building on Northern Virginia’s prominence as a mecca for federal contractors by raising $1 million toward its new GovCon initiative, which is focused on preparing students to work in government contracting. GMU has hired John Hillen, former president and CEO of Sotera Defense Solutions, to chair the initiative. In addition to building a new home for its business school, Liberty University is developing a new automotive dealership management curriculum in partnership with Charlotte, N.C.-based Hendrick Automotive Group, the nation’s largest privately held car dealership group. Hicks, the school’s dean, notes only two other colleges in the nation offer similar programs, despite the fact that the United States has the second-largest auto industry in the world. The U.S. has about 118,000 dealerships, employing a variety of workers in positions ranging from administration and sales to back-office financial workers, information technology to mechanics. The new curriculum also will address topics such as how dealerships can successfully adapt to a rapidly changing marketplace, which now includes driverless cars as well as on-demand transportation services such as Uber.